It seems that children are involved in more structured activities, and increasingly expensive activities, with each generation. With organized sports, piano lessons, and not to mention childcare, parents are increasingly feeling the financial burden of all of these activities. Thankfully, there are a number of tax measures available to help reduce the financial burden on families with children. 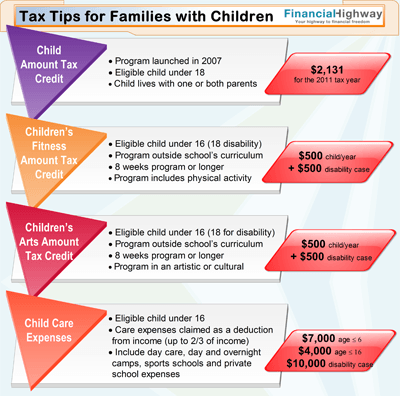 The Child Amount Tax Credit was a new program launched by the government in 2007. This credit offers a tax credit of $2,131 (for the 2011 tax year) per child under eighteen where the child lives with one or both parents. In cases where the child does live with both parents, the credit can be claimed by either spouse, with any unused amount transferred to the other spouse. The government launched this tax credit in 2007, offering families a deduction of up to $500 per child, per year, for certain physical activity programs. The child must be under sixteen at the beginning of the tax year in order for the credit to be claimed, or under eighteen if the child has a disability. Individuals with a child that has a disability can also receive an additional Child Fitness Amount Tax Credit of $500. There are strict eligibility requirements for which programs are acceptable when claiming the Child Fitness Amount Tax Credit. First, any program must be outside of a school’s regular curriculum, which does not prevent claims related to extracurricular school activities. In addition the program must be eight weeks or longer, and most of the activities must include physical activity. The government defines physical activity as activity which contributes to cardio-respiratory endurance and at least one of the following: muscular strength, muscular endurance, flexibility or balance. This is a valuable tax credit that you do not want to miss if your children are involved in sports or activity programs. The credit can be claimed by either spouse, or divided between two spouses. Ensure that no food, travel or accommodation costs are included in your claim, these are specifically disallowed. This is a new tax credit for 2011 and is structured similarly to the Children’s Fitness Tax Credit. Again, the same age limits apply, under eighteen for children with a disability and under sixteen for all other children. However, in the case of the Arts Tax Credit, the credit is for costs associated with programs of artistic, cultural, recreational or development activities. The credit amount is a maximum of $1,000 for children with disabilities and $500 for all other children. Programs in the case of the Children’s Arts Amount Tax Credit must also be eight or more weeks long and not part of a regular school curriculum. The programs must, in an artistic or cultural discipline, be intended to develop a child’s creative skills, their ability to acquire and apply knowledge or improve their coordination. Clearly, this is a fairly wide definition and many programs would be eligible, from art and dance classes to even Boy Scouts. As with the Fitness Credit, one spouse can claim the tax credit, or it can be divided between two spouses. Food, travel and accommodation costs are explicitly disallowed. Many child care costs are tax deductible, subject to certain restrictions and limits. Child care expenses must be claimed by the parent with the lower net income for tax purposes. In the case of separate parents who share child care obligations, costs should be fairly divided. Child care expenses are not claimed as a tax credit; rather they are claimed as a deduction from income. This is a substantial difference as deductions from income are refunded at the highest tax rate applicable to your income level, whereas tax credits are refunded at the lowest tax rate. This difference can be considerable, especially for high income earners. Eligible children are those under sixteen years of age at the beginning of the tax year and who themselves have a net income for tax purposes in the previous tax year of less than the basic personal amount. Permitted expenses include day care, day and overnight camps, sports schools and private school expenses related to child care. These expenses must be incurred in order to allow the claiming parent to work, operate a business or attend a recognized educational program. If a relative is providing the child care services, these costs can be eligible in certain situations. The relative must not claim a tax credit claiming the child as an eligible dependant nor can the relative claim the caregiver amount. The claim must not exceed two thirds of your income. As you can see by looking at the broad range of tax credits available, it can be very beneficial to take the time to understand the child tax credits available and ensure their maximum use in reducing your tax burden.